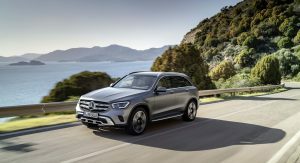 The facelifted 2020 Mercedes-Benz GLC has just premiered as next week’s Geneva Motor Show inches closer. 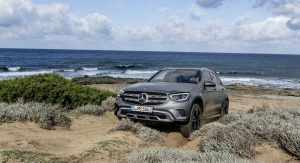 Mercedes-Benz dropped a teaser video of the updated model yesterday but unfortunately, it offered few details about the vehicle’s new exterior. 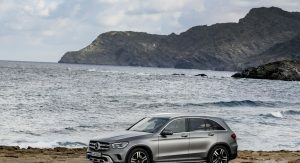 As we suspected, however, the 2020 GLC doesn’t look any different than the outgoing model, unless you really look hard, but it does borrow some fresher styling details from the larger Mercedes-Benz GLE. 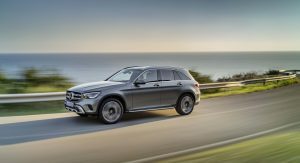 For example, the front of the facelifted GLC now includes a similar grille to the GLE, complete with two silver horizontal slats. 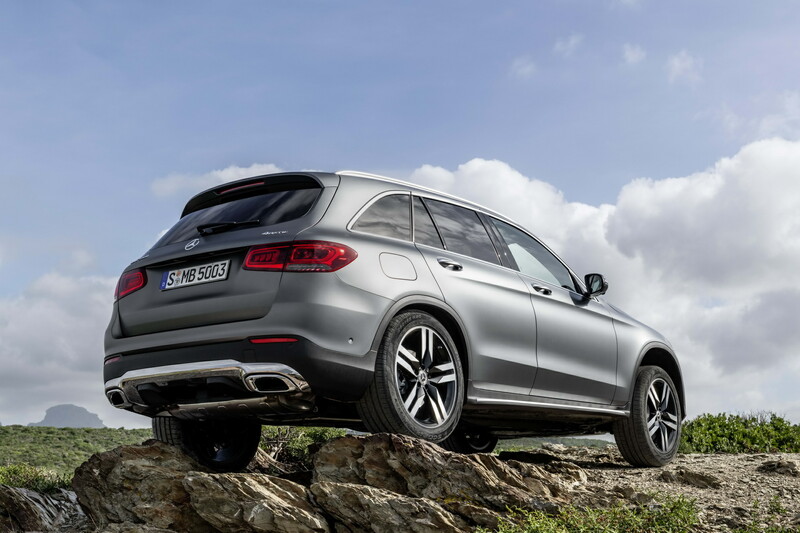 The GLC’s hood also features similar character lines to its larger sibling. 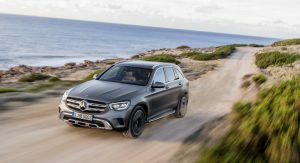 In addition, there is a hint of the smaller Mercedes-Benz GLA facelift in the GLC’s redesigned front bumper. Different headlights with incorporated LED daytime running lights have also been fitted by the German automaker. 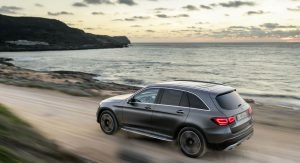 The side profile of the SUV has gone largely unchanged but Mercedes has made some alterations to the rear, namely with the fitment of different taillights. A range of new wheel designs have also been designed for AMG Line-badged models. Of far more importance than the exterior modifications is what’s going on in the cabin of the facelifted GLC. 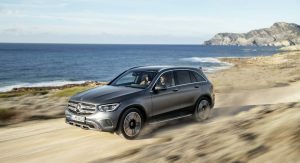 The new SUV comes standard with the brand’s MBUX infotainment system which consists of a sleek multimedia display that includes gesture and voice control functionality. Customers can also option a fully-digital, 12.3-inch instrument cluster to sit alongside the MBUX free standing 10.25-inch display. 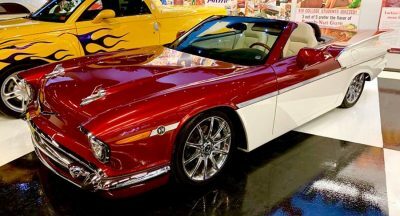 Other interior upgrades include a new multifunction steering wheel and a multifunction touchpad on the center console. 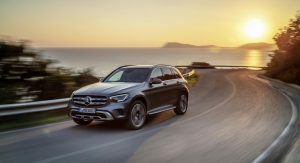 Sales of the Mercedes-Benz GLC will initially start in select markets in GLC 220d, GLC 300 4MATIC, and GLC 300d 4MATIC guises but in the United States, the SUV will only be sold in GLC 300 rear-wheel drive and 4MATIC forms. 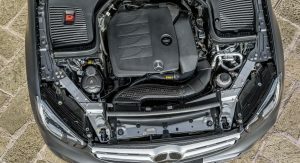 These two gasoline models use the newer M264 engine 2.0-liter turbo inline-four engine with 255 hp and 273 lb-ft (370 Nm) of torque, 14 hp and 2 lb-ft of torque more than the outgoing model. 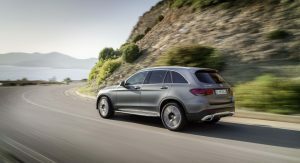 As for the GLC 220 d and GLC 300d 4MATIC models that will be sold outside of the U.S., both use a 2.0-liter turbocharged four-cylinder. 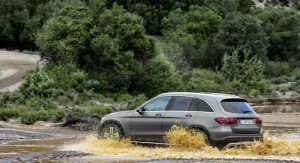 Power for the GLC 220d sits at 191 hp and 295 lb-ft (400 Nm) while the GLC 300d 4MATIC pumps out 241 hp and 368 lb-ft (500 Nm) of torque. 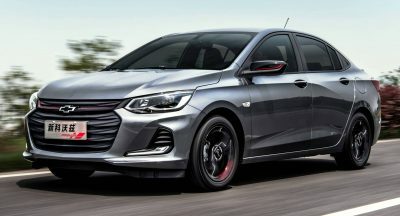 A small electric motor is also found in the petrol 300 models sold outside the U.S., powering the 48-volt electrical system, doubling as a starter motor, lowering fuel consumption, and adding 110 lb-ft (150 Nm) of torque when it’s needed. 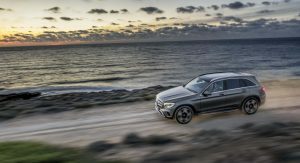 Mercedes-Benz has also outfitted the new GLC with a range of safety features, including Active Distance Assist Distronic, Active Steering Assist, Active Lane Keeping Assist, Active Blind Spot Assist, and Active Lane Change Assist. 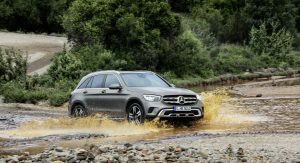 The facelifted GLC also includes a new Dynamic Select system which responds to the requests of the driver and seamlessly adjusts the handling settings to suit particular road conditions. 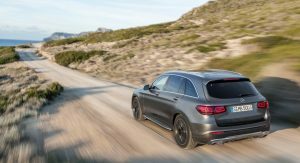 Alterations have also been made to the 4MATIC all-wheel drive system and three-stage ESP which offers Sport and Sport+ drive modes. 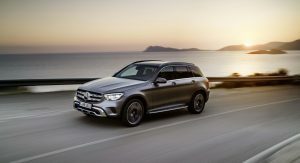 U.S. sales of the 2020 Mercedes-Benz GLC will start in the United States in late 2019. I think so. Including Augmented Reality Mapping: Info at Daimler Media Site. No that’s the latest evolution of the former COMAND system seen on the updated C-class. 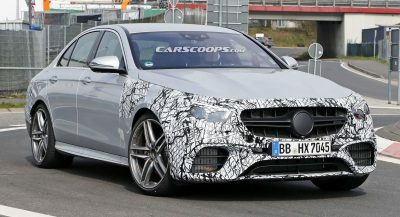 MBUX will come soon in the new generation GLS and in the facelifted E-class, CLS and AMG GT 4 door. Well thought-out, ergonomic, comfortable – these guidelines governed the advancement of the operating and display concepts used in the GLC. The focus is on the interaction with the vehicle and its functions through gestures, touch or the voice control system. 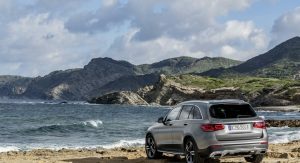 This is made possible by the latest telematics generation of the Mercedes-Benz User Experience, which is characterised by intuitive logic and a wide range of operating options. Overall, the interplay of the touchscreen displays, the navigation with augmented reality, the intelligent voice control and the user interface sets real standards. The information the driver needs are shown on two high-resolution displays. Optionally, the instrument cluster measures 12.3 inches. The free-standing multimedia display in the centre is available in two sizes: Seven inches with a resolution of 960 x 540 pixels and 10.25 inches with 1920 x 720 pixels. The driver can choose from three individual representations to suit the mood or the interior: “Classic“ is an advancement of a classic display, “Sport“ presents a high-contrast high-tech look, “Progressive“ visualises modernity in reduced form. The graphics in brilliant quality underscore the comprehensibility of the intuitive operating structure. New additions are the touch sensitivity of the multimedia display – and the Touch Control buttons on the multifunction steering wheel for operating the instrument cluster and the multimedia system. 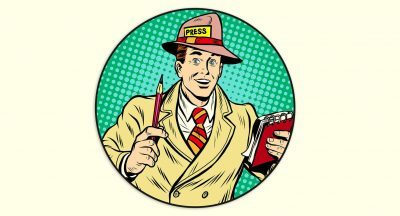 Another effortless way of operating the multimedia system is the Interior Assistant. A camera in the overhead control panel captures the movements of the hand as it approaches the touchscreen or the touchpad on the centre console. The system makes a distinction between the gestures of the driver and the front passenger, which changes the image on the media display accordingly by highlighting or enlarging individual elements. The reading spot also can be switched on and off by hand control. To this end, the light in the overhead control panel follows the movement when the driver is looking for something on the front-passenger seat, for example. In addition, there is the option of operating a favourite function of the multimedia system by a specific gesture that was stored previously. Another highlight in conjunction with MBUX is the Augmented Video optional extra, which complements the navigation in a useful way. A camera in front of the rear-view mirror captures the surroundings and automatically shows information on the multimedia display that complements the video image. This includes traffic signs, information about where to make a turn, house numbers or names. This makes orientation – such as the search for a given address specifically – quite a bit easier. The revised voice control system makes operation even more convenient and natural. By voice command, the driver can have the system read out text messages, operate the audio systems or access vehicle functions such as the climate control system, for example. 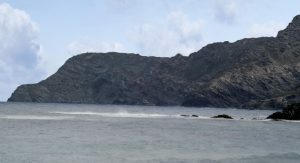 The system requires no memorised commands – the user has the freedom, for example, to phrase the desired destination address or the question about the weather report off-the-cuff. What else is possible now: activating the voice control with the “Hey Mercedes“ prompt. The talk button on the steering wheel is additionally available for this purpose. A new GLS could it be buried on Oak Island. 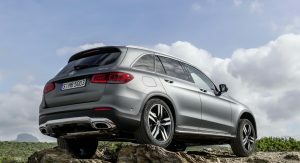 They say it’s a 2020 why are they keeping it such a secret when the GLE had been shown and the X7 is unveiled, I’m not waiting until 21 I’ll buy the Bimmer. Well a new model is being released when its being released and releases follow a certain product and production plan. That’s nothing new though. Just because a certain competitor released its new model (which just barely starts deliveries now) shouldn’t push me to abandon my product strategy planning (which includes estimated competitor release dates already). The X164 ran for only 6 model years 2007-2012 while the X166 has already reached it’s seventh year (with a glue on iPad on the dash). The GLE which is a 2020 is everywhere. My point is that Mercedes should not take it’s customers for granted. The mules have been around for 3 years why are they making customers consider there options? Mercedes isn’t taking its customers for granted. 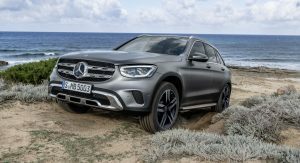 The GLE (V167) is just starting it’s market introductions around the globe and had it’s official unveiling in autumn 2018. The GLS unveiling hasn’t even been yet. And I see no problem at all getting the next generation GLS to the market within the nearer future. 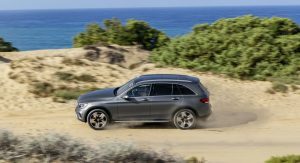 And for the delivery of all vehicles in Mercedes-quality from day one things take time as well as the usual production ramp-up within the Tuscaloosa plant where both vehicles are manufactured. Having mules and prototypes around for 2-3 years is common with any new generation car. What have others done what Mercedes hasn’t done? 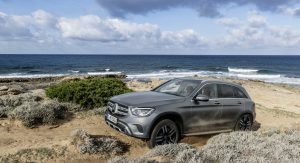 The GLC features the styling with the (optional) digital instrument cluster plus the 7″ or 10.25″ media display like the C-Class models. 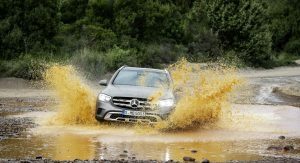 But the tech behind it is a full version MBUX as in the GLE or CLA with interior assistant etc. Also the media display is a touchscreen compared to the C-Class models. I’m not mad at it. 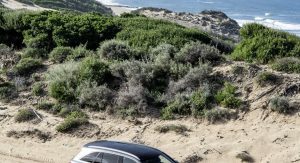 I mean the simple tweaks and updates bring it right back inline with the new GLE, albeit the GLC pretty much lead this era of MB design for their crossovers, so it wasn’t going to take much anyway to do so. I like the new lights. The headlights make this look aggressive at times, but not so much at others, it’s a nice balance that will appeal to a lot broader of market. The interior also looks much more fluid and less cluttered compared to before, which is really nice. I loved our GLC43 but didn’t love the interior because it felt too much. It looks like a bull dog in the face to me. But it still nice update. I am happy MBUX made it into this generation. The grille has more ute feels than luxury..this should be reserved for the rugged offroad version. I like the chunkier-looking front end. Looks like the current model!